We’d love your help. 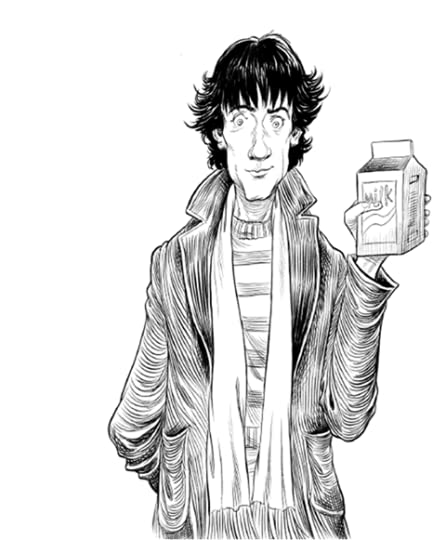 Let us know what’s wrong with this preview of Fortunately, the Milk by Neil Gaiman. Find out just how odd things get in this hilarious New York Times bestsel "I bought the milk," said my father. "I walked out of the corner shop, and heard a noise like this: t h u m m t h u m m. I looked up and saw a huge silver disc hovering in the air above Marshall Road." To ask other readers questions about Fortunately, the Milk, please sign up. This question contains spoilers… (view spoiler)[Am I the only one that didn't get the ending? How does the dad prove the story? There was something very good about this book. It was an ‘enhanced edition’ which means that the writer reads the book out loud to you while you read it! This writer is a good reader and he didn’t sound at all like the dalek voice that normally comes out of the Kindle. Mum said I could stay on the iPad if I wanted to draw a picture of the writer reading the book. But I can’t draw good faces so I drew a picture of the Kindle talking. Then I labeled it ‘Kindle’ because Mum asked what it was. I started to read. This is me reading. And no. My face is NOT the book. Everyone should read this book. It will make everybody laugh. It is good and very clever. The best thing is that it goes backwards and forwards in time with the Dad meeting himself all over the place in the past and in the future and in crazy wormholes. It has good characters. The dad is a funny dad. I also like the brother and sister because they are not stupid. They ask the dad clever questions to try and trap him, but he is good at wiggling out of trouble. One day I would like to write books as good as ‘Fortunately, The Milk…’ and draw pictures as good as this too. Notes: Gaiman, like a chef savant boldly tossing supposedly dissonant ingredients into a pot, makes a heck of a tasty stew. It was a rainy morning and I felt like reading Neil's new book 'Fortunately, the Milk'. So I popped on my favourite astronaut t-shirt and caught the bus to my local bookstore, Snuffin and Kooks. I looked high and low for Neil's book, but all that was there were stacks of Paranormal Romance as far as I could see. "Excuse me," I said to the nearest droopy-eyed sales attendant. 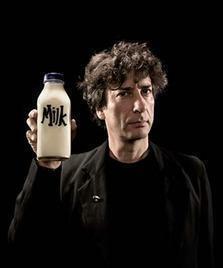 "Do you have Neil Gaiman's new book, 'Fortunately, the Milk'?" She rolled her eyes so far back that I thought for a moment It was a rainy morning and I felt like reading Neil's new book 'Fortunately, the Milk'. So I popped on my favourite astronaut t-shirt and caught the bus to my local bookstore, Snuffin and Kooks. I looked high and low for Neil's book, but all that was there were stacks of Paranormal Romance as far as I could see. She rolled her eyes so far back that I thought for a moment she was inspecting her own sinus cavities. "All the hipsters have already bought out our entire stock" she replied. She gave two ineffectual chews of something. "So you are one of those hipsters." I left in a huff and a grumble, mumbling things about prescription lenses and Vampire Weekend being a good band anyway. I returned to the bus-stop which which was covered, unfortunately the covering did not seem to be designed to keep the rain off, rather to concentrate the droplets and deposit them upon the head of a waiting passenger. I was soon joined by another hopeful passenger, an old lady who smelt of wet cardboard and boiled sweets. "You look down dearie," she said, and I explained my predicament to her. "Well, I know of a place that sells books. I bet they'll have that Neil Armstrong book of yours. It's a cafe down the main street there, and you go left down the lane with the shoe store on the corner and it's halfway along on the left." Despite knowing that a cafe that sells books would never sell the books I like, I decided to investigate due to my boredom and to make an old lady happy. I knew the shoe store, but not the lane. I thought it was next to the kebab shop that was quite obviously a front to an underground bikram yoga class. But as I arrived I saw that there was indeed a lane between the two and it had a sign stating that it was "Aquap Lane". It was there that I slipped in the wet and thought that this was too Harry Potter for my liking. When I came to I was in a dark space with a shrunken man looking a me while holding a candlestick Wee Willy Winkie style. "Where am I?" I asked the small man. "You're in a pocket dimension. How did you get here? I don't want them in here!" he spat at me. "I was looking for a book. Neil Gaiman's new book." "Is it paperback or hardcover? Cos you'll only find paperbacks in a pocket dimension. God, what do they teach you kids these days?" "Calculus. But why do you call this place a pocket dimension?" I asked. "Because, you see, it is a dimension that could fit in your pocket. It's essentially a pocket-sized dimension it is," he explained with a smirk on his face. Fortunately this smirk had a half-life of about one and a half seconds. The loss of smirk corresponded to the rise in volume of clanking footfalls. "Oh you did it didn't you? You've gone and bought them. Well you'll not get that Neal's book from here", he scorned. "No it's a Neil book, not a Neal book," I yelled as a group of knights in armour clanked out of the darkness and seized the shrunken man and I. "Well you'd want a briefcase dimension for that kind of thing, not a pocket dimension. But I guess it's too late now." By torchlight (the ye olde, stinky, fat-covered fire sticks, not the battery powered ones, they're knights dammit) we were led into the inky darkness of the pocket dimension. We walked for what may be days, but it felt like minutes. Wait, is that the right way around? Well I guess that a pocket dimension has timey-wimey issues. Eventually we emerged through an archway into the light of day. It was a garden, a very intricate garden with topiary animals and paths of white gravel. Oh no, I thought, an Alice in Wonderland pastiche by a person who has never read the book and only seen the Disney film. But hang on, how did I know that having only seen the film and never read the book? Oh great it get's more cliched. "But can I plead my case Your Majesty? "I asked. "I do not know why I am here and what I have been accused of. And, by the way, I thought you were meant to be a Queen." "Well as you can see I am a king. Clever isn't it? No, not really. Anyhoo, you stand accused of writing an overly long pastiche review that by now no one is reading, nobody has even chuckled at and now you are destroying the fourth wall. Or is it the fifth? I've never been one for architecture." "Guilty as charged Your Highness," I confessed. "I thought everyone would like it and think I was clever. But I guess all it has ended up being is a waste of a morning when I have more productive things to do. I could have gone to the bookstore instead. Hang on, that was in the review universe not the real universe. Now things are getting silly." "Indeed", confirmed the King. "And therefore I sentence you to finish this atrocity of a review as soon as possible without using the waking up from a dream scenario. I hate when they do that!" "Well it would expedite this review if you had a copy of Neil Gaiman's new book 'Fortunately, the Milk' that I could read very quickly. That would be mighty helpful Your Highness." "Luckily I have a copy right here in my ermine cape. I was reading it earlier and I found it a quite fine read. I did not like the ending though. Who'd have thought that all that time the milk was the murderer not the train driver? Absurd." "Well no need to read it now. Thanks anyway." Fortunately, I read this book! Quite funny, entertaining and it's a really quick read. ...And for that hour I had such wonderful time. In an hour I was lost in time, meeting fantastic characters and laughing. If you decide to read it, keep in mind that it's a short story oriented for children, so please, don't harm the rating of this sweet book just because you were expecting "Neil Gaiman, the gre Fortunately, I read this book! If you decide to read it, keep in mind that it's a short story oriented for children, so please, don't harm the rating of this sweet book just because you were expecting "Neil Gaiman, the great mind behind Sandman and American Gods". ...You will find "Neil Gaiman, the wonderful dad that wrote a story to entertain for an hour to his children and the children of all the world." 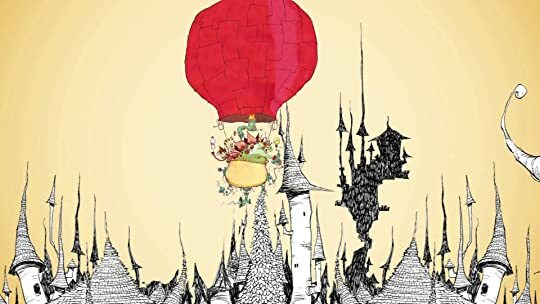 Along with Neil Gaiman, in here you will find the delicious art of Scottie Young, talented artist famous for his work on the Marvel's graphic novel adaptations of the OZ books by L. Frank Baum, that he worked there with Eric Shanower. (By the way, you can check on my shelves of Goodreads, you will find reviews of all those books too). Gaiman and Young are a wonderful team where the words of Neil make a perfect amalgam to the drawings of Scottie. I won't spoil anything (don't worry! Geez! ), I just want to comment that if you ever been able to contain yourselves of reading aloud the lines of the wumpires (yes, you read correctly...wumpires), well I just can say that you have more selfcontrol than me! Because I just have to say aloud those phrases with my best imitation of the expected accent! Oh, yes, I had to do it. And I'm not ashamed of admit it! Keep loyal to your wumpires! Be proud! For an hour, Neil and Scottie take us to a funny wacky fantasy adventure, but at the end, they let you to decide if all was lie or not. ...life is too short for not believing in fantasy at least for an hour. If you can't being a kid again at least for an hour and laughing with a sweet story like this one, geez, please look for an empty grave and jump in there, you are already dead and nobody told you! So, getting back to the final credits, in this book, read them or you will miss the final joke. If you don't get it, please do some memory tests, since you have to get it, you just read it less than hour ago! Now, I leave, I have to go to the market for some milk! 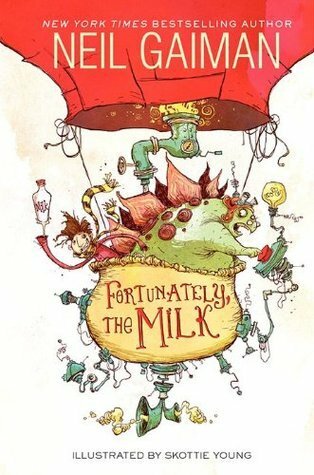 Neil Gaiman’s latest book, “Fortunately The Milk” is a boisterous tale of an extraordinary adventure, time travel and milk. Gaiman’s is full of surprises, jokes and an awful lot of just being plain silly. If you can’t tell already, I loved this book. Gaiman’s tale narrated by a boy whose mother is away on a business trip, and whose father had to go out to the corner store for a pint of milk for the cereal and his tea. Dad takes an unconscionably long time getting the milk, and when he returns, the narrator and his little sister accuse Dad of having stopped to gossip at the store. Not so, insists Dad, who proceeds to explain exactly what happened while he was out getting the milk. It's an astounding tale, starting with an alien abduction, moving swiftly onto a space-time journey to the ship of a vicious pirate queen and a near-death plank-walking, a daring rescue by a time-travelling dinosaur scientist in a hot-air-balloon time machine, and thence through interference with a pre-Colombian human sacrifice, and many, many other adventures, including several involving temporal paradoxes. For all the mad-cappery, there's a fair bit of attention here to an internally consistent time-travel story, with all the fun that implies. By the end, we are in a kid-safe place that's one part Douglas Adams, one part Doctor Who, and one part Walter Mitty. It's quite a mix! I listened to this on audiobook during a car trip with my oldest boy, (Oot, Age 4.5). We both really enjoyed it. Though didn't get to see the illustrations, we got to hear Neil himself reading it, and he's a very, very good narrator. If you've never heard him reading his own stuff, you're really missing out. Five bucks on Gaiman throwing darts at an idea-board. Why? Maybe cause of the time traveling dinosaurs, unicorns, wumpires and aliens. For such a decidedly whimsical book, it was unexpectedly fabulous. Two kids are left home alone with dad for a weekend while scientist-mom is at a conference (unexpectedly great reason for mom to be gone for the week!). Only, when it comes time for breakfast...the kids discover that there's no milk for their cereal. Their dad bravely ventures forth to pick up some Five bucks on Gaiman throwing darts at an idea-board. Their dad bravely ventures forth to pick up some from the corner store...and he's gone an awfully long time. So long that the kids demand an explanation when he returns. And, their dad opens his mouth...and this wonderful tale spills out. It was hilarious, fun and an all-around delight. Plus, the illustrations were adorable. A quirky tale of time travelling dinosaurs, blood sucking wumpires (yes, wumpires) and enthusiastic pirates, made even more amusing by an abundance of winsome illustrations. Funny! Silly! Crazy but sweet! This is an excellent book to read aloud to 4th grade kids who are in the process of developing a sense for the absurdities of life. It is mainly about telling stories and that you can make up a great plot about anything, no matter how boring the so-called truth of every-day life is. Small things give you big ideas - and they don't have to make sense. Fortunately, the milk was out - otherwise a couple of children would have missed out on aliens, pirates, Splod and va Funny! Silly! Crazy but sweet! Fortunately, the milk was out - otherwise a couple of children would have missed out on aliens, pirates, Splod and various mind-boggling problems that usually occur when you travel back and forth in time with a dinosaur professor. Update: The fourth grade kids are now Grade 8 students (that is unbelievable enough - they must have opened that door that let in the time-space-continuum! ), and they still refer to the time when I read "Fortunately the milk..." aloud to the class. I would say that is the best praise a children's book can get. "Then the milk touches the milk" has become an insider saying! Either the universe will end, or we will be watching the madness of dwarves with flower pots go on for a while still. This book is about a father who buys milk for his children. And after that, he gets trapped in a space-time continuum by aliens who wants to re-model the planet Earth and wants permission from him to do so as he is a representative of planet Earth. Lol! Father is telling his children the story of how he gets back to present-time in the whole book. It's a very delightful read. I enjoyed it. Really liked the adventures. This fact is very odd for me that if the aliens want to re-model the planet Earth then why the heck they want permission.. lol! My favourite scene in book was when the Father met the king of Volcanos. Hahaha.... really enjoyed that scene. I couldn't get it as author didn't mention it well. He just mentioned it in illustration. In the ending, children felt that their father was lying about his adventures as they remembered the similarities between their father's story and their paintings. Father was actually lying about it as he got late in coming or he was telling the truth? I have a very confused feeling about it. Regardless, it is a delightful read. Especially for children. But it was a fun read for me also. I will must read his other works too. I HATE tea, for the record! But my whole family love it. Except for me. Very strange. Prava, pravcata dečija knjiga. Ako niste u stanju da se vratite u najbezbrižnije godine svog detinjstva, onda čitajte ovu knjižicu na ličnu odgovornost. Ilustracije su fantastične, kao i uvek kada Kris Ridl umeša svoje prste u Gejmenove specijalitete. Nisam pametna da li dam 4 ili 5 zvezdica, a ovaj smotani Goodreads još uvek nam ne da koristimo pola zvezdaje, pa neka bude 4. This one's a wonderfully fun and enjoyable read! Timeless tale of time!! "It’s important for people to tell you what side they are on and why, and whether they might be biased. A declaration of members’ interests, of a sort. So, I am going to be talking to you about reading. I’m going to tell you that libraries are important. I’m going to suggest that reading fiction, that reading for pleasure, is one of the most i Incredible! "It’s important for people to tell you what side they are on and why, and whether they might be biased. A declaration of members’ interests, of a sort. So, I am going to be talking to you about reading. I’m going to tell you that libraries are important. I’m going to suggest that reading fiction, that reading for pleasure, is one of the most important things one can do. I’m going to make an impassioned plea for people to understand what libraries and librarians are, and to preserve both of these things." Cooperation between Neil Gaiman and Chris Riddell always results in something special. This is children's book but it's one that brings back child in me (which to be honest isn't that deeply buried). I had wide grin through out whole reading. Savrsena knjiga za malisane napisana sa puno maste i prelepim crtezima. What happens when Mom is away at a conference and Dad is left in charge? Well, of course they run out of milk. Follow along on Dad’s remarkable expedition to retrieve more milk. His adventure is filled with hot air balloons, dinosaurs, aliens, ponies, vampires and a talking volcano??? Gaiman could write anything – I mean absolutely ANYTHING and I would read it, so when this definitely-written-for-kids children’s novel popped up on a Gaiman stalking . . . errrr, I mean Gaiman absolutely-normal-nothing-to-see-here-folks fan page, I knew I had to read it right away. Not only did I go on quite the amazing journey with Dad, I also learned everything I ever needed to know about transtemporal metascience and a catchy little diddy called “I’ve Got a Lovely Bunch of Hard-hairy-wet-white-crunchers” that I simply can’t seem to get out of my head. As always, Gaiman is brilliant. As a woman of an age which shall not be mentioned, I found this story absolutely delightful and the illustrations are the best I’ve seen since I was a little bitty one. Buy it/check it out from the library for yourself, your kids or your grandkids. No one will be disappointed. I was planning to pick this up for myself anyway, but I needed a book to keep the smallest person who lives in my house interested during mandatory reading time so I rushed straight to the library. Yeah you heard me right – punishment by Gaiman. Every freakin’ child in the world should want to live at my house. Thank god for Skottie Young, his expressive and original style was the thing that kept me turning the pages. It's hard for me to say that because I want to like Neil Gaiman. And I am OBSESSED with The Graveyard Book, and I've been trying to find some other work of his to praise, but unfortunately this isn't it. It's an okay book. The story is kinda cute, in a cutesy rambling sarcastic way. It seems forced and quickly told, like Neil was at a party telling this story and someone wrote it down and Thank god for Skottie Young, his expressive and original style was the thing that kept me turning the pages. It's hard for me to say that because I want to like Neil Gaiman. And I am OBSESSED with The Graveyard Book, and I've been trying to find some other work of his to praise, but unfortunately this isn't it. It's an okay book. The story is kinda cute, in a cutesy rambling sarcastic way. It seems forced and quickly told, like Neil was at a party telling this story and someone wrote it down and published it without any real editorial input. Even the milk itself seemed an afterthought instead of the driver. I'm sure Gaiman fans will wax poetically about the story's grand and imaginative plot. But I just can't. It's an okay story. I would tell parents to get it and read it to kids at bedtime. But it isn't something I would actively promote. Maybe what I wanted from this story was more development, maybe (like everything with Gaiman) I have this grand idea of what he "should" write, I can't appreciate what he actually writes. A story can be found in every moment, step, and nook & cranny in life. Even a quick trip out for milk can turn into an adventure. Especially with Neil Gaiman around! The man has once again stolen my heart, giggles, and smile with a nonstop, swashbuckling spin through time and space with pirates, aliens, and wumpires. Come on, let go, and allow your imagination to wander around in Neil Gaiman’s head for a bit. Our story begins in the kitchen. Two kids, with dashed hopes and dry cereal, stare into the fridge where the milk is supposed to live. Dad comes to the rescue though and dashes off to the store to save breakfast! But time and ages and ages tick. tick. tick by. Just as the kids begin to slump, sigh, and strongly consider soaking their cereal in orange juice, Dad swoops back in the door with much more than just milk. You have to hear this highflying, alien abduction, will-the-milk-make-it-home-in-time tale and spin on what happened to me on the way to the store! The twists, turns, and connections through time had me grinning ear to ear. It’s a fast, furious, action packed ride filled with laughs and creatures galore—even piranhas! PIRANHAS! Oh, how I love those little guys with the big, mean bite! Only Gaiman could somehow, some way squeeze piranhas into a pop-out-to-the-corner-store-to-get-milk tale. Energy, wonder, and humor bring Dad’s courage, fun, and quick thinking to life on the page. Around page nine or ten, I found myself not only laughing out loud, but reading out loud as well. Words like "FIZZ", "PLIP" and “thummthumm” needed and wanted out and off the page. I loved how each noise, bellow, and word sounded and felt rolling off my tongue. My room felt alive with the story’s energy and magic! And oh does Mr. Gaiman capture the magic of storytelling perfectly on the page—captures the joy and magic of a Dad telling a story to his kids. Pure, pure bow your heads to the reading gods magic! And just when you think this could not get any better…Boom! We get pictures! 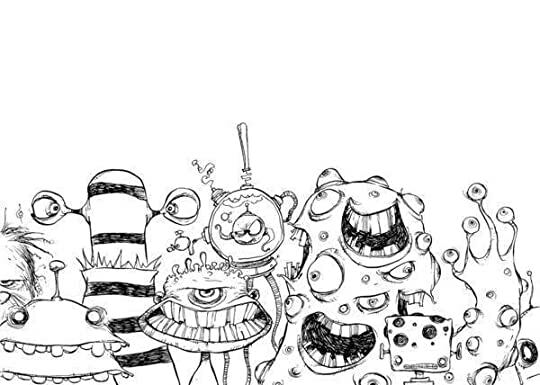 :D The word magic is brilliantly matched and fueled by Skottie Young’s black & white, detailed illustrations of the fun. His visions keep this journey rolling! Gross, funny, and fast! We can go from snot bubbles to dazzling smiles in a blink of an eye. Mr. Young’s darkness, creeps, and enthusiasm will have readers flipping through again and again just to get another look at this wonderfully odd world and characters. I try my hardest not to reveal too much detail and plot in a Gaiman review, but just know this book holds a surprise and smile on every page. Words that will spark a reader’s imagination and maybe even some research—Are piranhas only found in fresh water? Off to find out…..
A fun recommended read for any and all adventurers and time traveling fans. And as always—a must read for Gaiman fans! I never know where he will take me. اینو با ستایش و بهداد و بهنام خریدم، باغ کتاب تهران. مینویسم که یادم بمونه چه روز خوبی بود کنار این آدما. من خیلی نیل گیمن رو دوست دارم. از خوشبختانه شیر هم خوشم اومد، اما نه اونقدی که انتظارش رو داشتم! بهنظرم یه جاهایی داستان زیادی ساده گرفته شده بود. درعین اینکه یه جاهایی خندهدار بود. با کارهای دیگۀ گیمن فرق داشت اما بازم نیل گیمنطور بود. :دی من مال نشر پریانش رو خوندم، نه این یکی رو. یه چیز ساده رو مثل قصههای قدیمی ایرانی پر و بال داده بود و سنجاق شدنش به اتفاقات بانمک و هوشمندانه بود. اینو با ستایش و بهداد و بهنام خریدم، باغ کتاب تهران. می‌نویسم که یادم بمونه چه روز خوبی بود کنار این آدما. من خیلی نیل گیمن رو دوست دارم. از خوشبختانه شیر هم خوشم اومد، اما نه اونقدی که انتظارش رو داشتم! به‌نظرم یه جاهایی داستان زیادی ساده گرفته شده بود. درعین اینکه یه جاهایی خنده‌دار بود. با کارهای دیگۀ گیمن فرق داشت اما بازم نیل گیمن‌طور بود. :دی من مال نشر پریانش رو خوندم، نه این یکی رو. یه چیز ساده رو مثل قصه‌های قدیمی ایرانی پر و بال داده بود و سنجاق شدنش به اتفاقات بانمک و هوشمندانه بود. Got a wife and kids in Baltimore, Jack. Fortunately, he didn't write it. And so, we're treated to a magical little tale of professorial dinosaurs, pirates, piranhas, and ponies. It's a merry old time, greatly enhanced by Skottie Young's illustrations. The story is Gaiman's attempt to write a book that casts fathers in a positive light. After writing The Day I Swapped My Dad for Two Goldfish and finding that a lot of people were giving it to their fathers for Father's Day as a tongue-in-cheek insult, he thought he had better make amends. So... the father as the hero of the day, does it work? Yes and no. Yes, as it's a pretty funny children's book full of zany characters and a ludicrous plot, involving pirates, time travel, aliens, dinosaurs, religion, volcanoes, hot air balloons and milk. No, in that I'm not 100% sure the dad comes out of it winning the day. His kids are unimpressed, but the reader will have enjoyed the ride. Note, the humour I think will work for all ages, though, rather like The Simpsons, it will hit on different levels for different ages. Adults are likely to get a lot more out of it than kids. As the funny compère stated at the start of the show - "This is a children's book you know? Yet there seem to be a disproportionate number of adults in here this evening. Many of you will need to leave!" It must have been about 95% adults, all of whom were laughing from beginning to end. 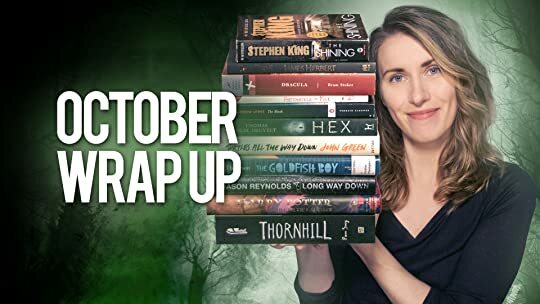 I listened to the audiobook via my library's BorrowBox service! 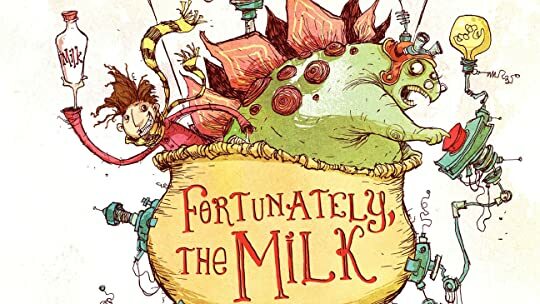 Fortunately, The Milk is a quick middle-grade read about a Dad who goes out to buy some milk one morning and arrives back to his children a little later than they would have liked. To entertain them, he tells them a story of his adventure involving the milk. There are dinosaurs, aliens, pirates... yep, lots more strange characters and events are included. It was a fun listen and narrated well by Neil himself. I did find myself laughi I listened to the audiobook via my library's BorrowBox service! Ovo je moj prvi susret s Gejmenom nakon kojeg mogu sa sigurnošću reći i početak jednog divnog prijateljstva. Moram napomenuti da nisam od onih odraslih koji imaju neutaživu potrebu da naglašavaju ono djetinje u sebi isticanjem da gledaju i uživaju u crtanim filmovima nazivajući ih animiranim. Ja sam, nažalost, bila ozbiljna i sa svojih šest i uvijek mi je nedostajalo mašte. Elem, ovo mi je predloženo od osobe koja me očigledno odlično poznaje iako se dosad nismo srele. Iz već navedenih razloga b Ovo je moj prvi susret s Gejmenom nakon kojeg mogu sa sigurnošću reći i početak jednog divnog prijateljstva. Moram napomenuti da nisam od onih odraslih koji imaju neutaživu potrebu da naglašavaju ono djetinje u sebi isticanjem da gledaju i uživaju u crtanim filmovima nazivajući ih animiranim. Ja sam, nažalost, bila ozbiljna i sa svojih šest i uvijek mi je nedostajalo mašte. Elem, ovo mi je predloženo od osobe koja me očigledno odlično poznaje iako se dosad nismo srele. Iz već navedenih razloga bila sam malo skeptična, ali nije bilo teško, već na prvi pogled, zaljubiti se u samu naslovnicu. Takođe, siže na koricama je neizbježno zainteresovao mamu troje male djece. He had to read it for school, and I read it with him. It was also my first Neil Gaiman book, and I wasn't very impressed with it. I cannot say it was bad or anything like that. Just not my cup of tea. All that said, it will always hold a special place in my heart because of my son. Well I'm forty and some loose change years of age and I never, ever thought I'd be reading children's books again. I can't even remember reading them when I was a kid but Neil Gaimans 'are but aren't reeeeaaaally' children's books are an absolute delight, so much so, that I've bought all of them. There's gentle murmurs and mutters of darkness within and Gaiman is a master wordsmith that wraps you up in his stories, and its impossible to get out until the very end. Fortunately, the Milk sees Fathe Well I'm forty and some loose change years of age and I never, ever thought I'd be reading children's books again. I can't even remember reading them when I was a kid but Neil Gaimans 'are but aren't reeeeaaaally' children's books are an absolute delight, so much so, that I've bought all of them. There's gentle murmurs and mutters of darkness within and Gaiman is a master wordsmith that wraps you up in his stories, and its impossible to get out until the very end. Fortunately, the Milk sees Father return slightly late from the shop with the vital lifesaving breakfast cereal milk and armed with legendary excuses of alien worlds and time travel. A thoroughly entertaining guilty pleasure that's kinda hidden from everyone who matters. We thoroughly enjoyed this, a time travel book for kids. It feels like Neil Gaiman once got himself in a bit of bother with his kids and needed an excuse to get himself out of trouble. The illustrations were wonderful, something to look at on each page, the main character looking like the author really helps. If you like books with dinosaurs, pirates, aliens, human sacrifices and time travel, then this book is for you. PS: If you like this and want another time travel book for kids then check out We thoroughly enjoyed this, a time travel book for kids. It feels like Neil Gaiman once got himself in a bit of bother with his kids and needed an excuse to get himself out of trouble. The illustrations were wonderful, something to look at on each page, the main character looking like the author really helps. If you like books with dinosaurs, pirates, aliens, human sacrifices and time travel, then this book is for you. Proving once again that its never too late to be a kid. Ameii isso aqui!! Ri alto com as coisas malucas que ele fala e é uma história que com certeza gostaria com contar pros meus filhos! O meu é ilustrado pelo Chris Riddel, meu favorito entre os ilustradores do Neil Gaiman. Que leitura deliciosa!